Thorium atoms have 90 electrons and the shell structure is 2.8.18.32.18.10.2. 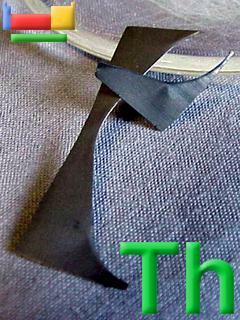 The ground state electronic configuration of neutral thorium is [Rn].6d2.7s2 and the term symbol of thorium is 3F2. Thorium: description Your user agent does not support the HTML5 Audio element. Thorium is a source of nuclear power. There is probably more untapped energy available for use from thorium in the minerals of the earth's crust than from combined uranium and fossil fuel sources. Much of the internal heat the earth has been attributed to thorium and uranium. When pure, thorium is a silvery white metal which is air-stable and retains its lustre for several months. When contaminated with the oxide, thorium slowly tarnishes in air, becoming grey and finally black. Thorium oxide has a melting point of 3300°C, the highest of all oxides. Only a few elements, such as tungsten, and a few compounds, such as tantalum carbide, have higher melting points. Thorium is slowly attacked by water, but does not dissolve readily in most common acids, except hydrochloric. Powdered thorium metal is often pyrophoric and should be carefully handled.When heated in air, thorium turnings ignite and burn brilliantly with a white light. Thorium is named for Thor, the Scandinavian god of war. It is found in thorite and thorianite in New England (USA) and other sites. 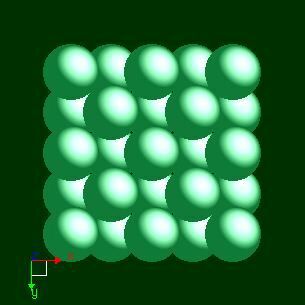 The solid state structure of thorium is: bcc (body-centred cubic). Thorium has no biological role. Reactions of thorium as the element with air, water, halogens, acids, and bases where known. Binary compounds with halogens (known as halides), oxygen (known as oxides), hydrogen (known as hydrides), and other compounds of thorium where known. Bond strengths; lattice energies of thorium halides, hydrides, oxides (where known); and reduction potentials where known. Thorium was discovered by Jöns Berzelius in 1829 at Sweden. Origin of name: named after "Thor", the mythological Scandinavian god of war. 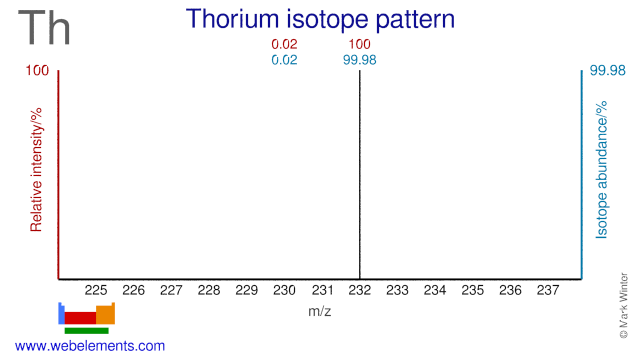 Isotope abundances of thorium with the most intense signal set to 100%.